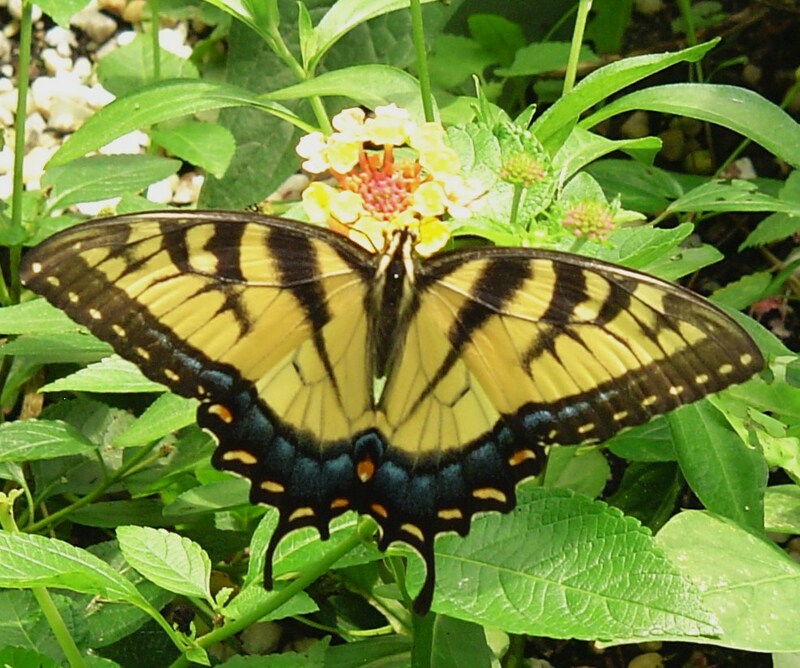 The Female Eastern Tiger Swallowtail on Lantana flowers. Eastern Tiger Swallowtail on a Hazelnut leaf. Maybe laying an egg? 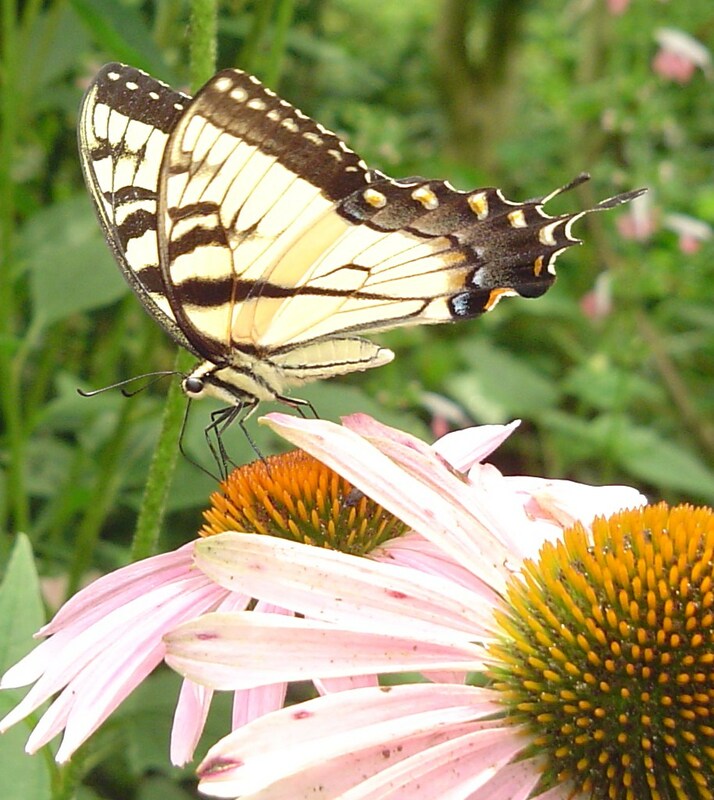 The male Eastern Tiger Swallowtail feeding on Echinacea, Purple Coneflowers. 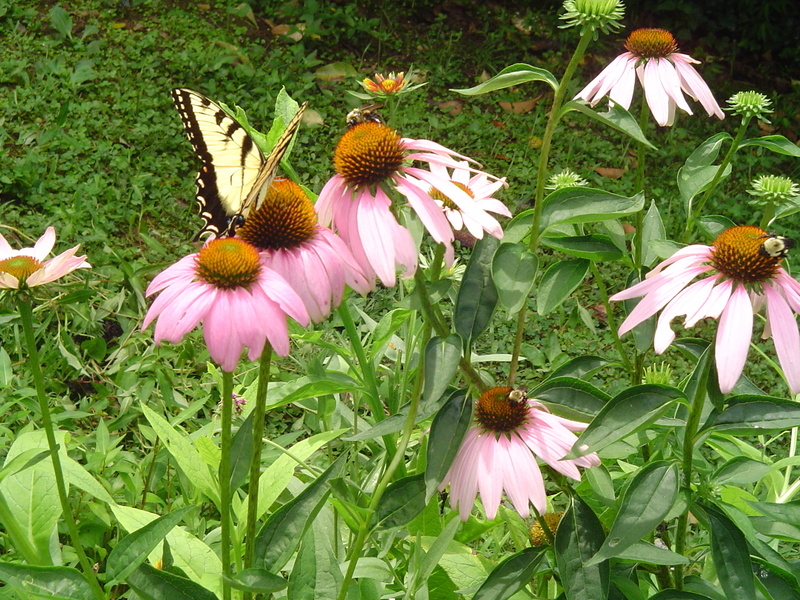 The adults feed only on nectar, causing no damage to the garden. 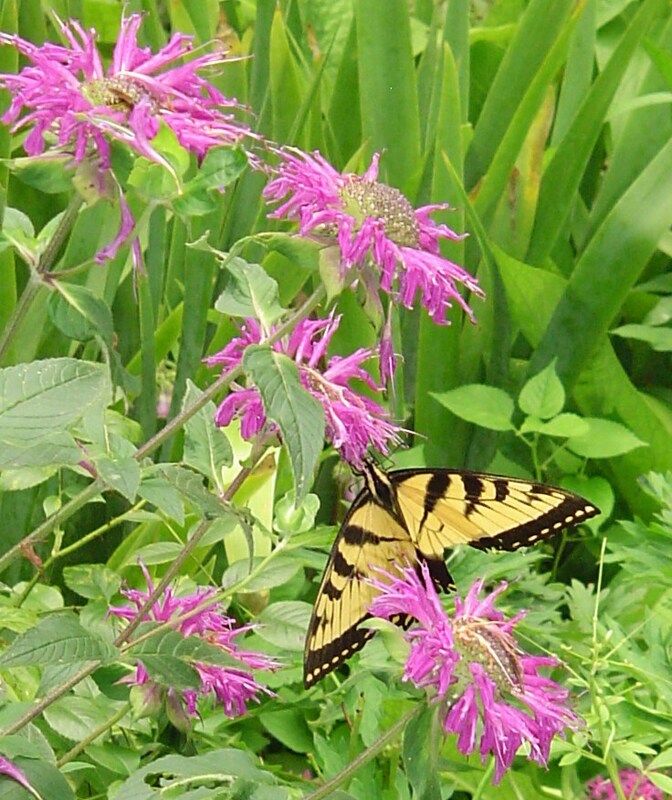 A male Eastern Tiger Swallowtail butterfly on Monarda, also called Bee Balm. 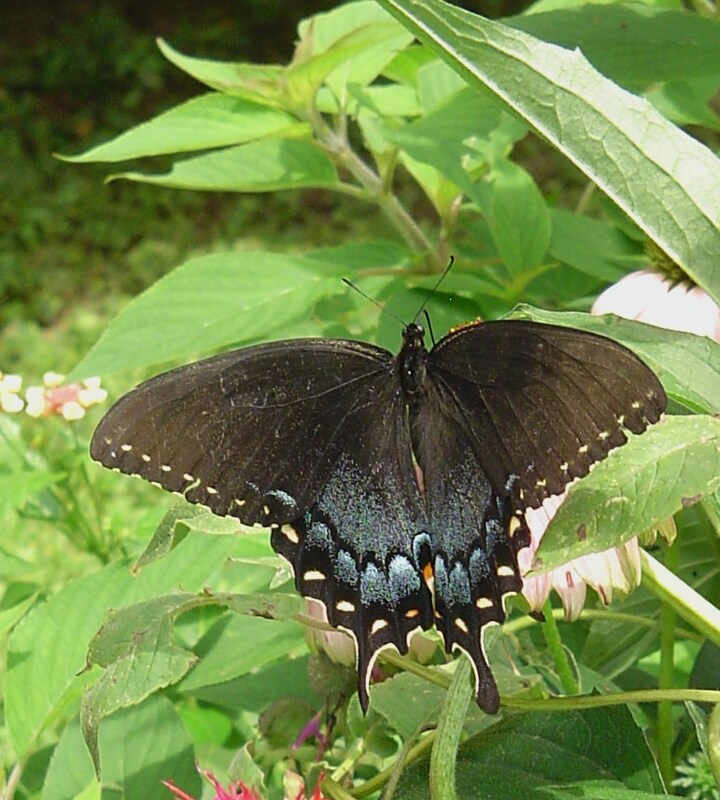 The male Eastern Tiger Swallowtail Butterfly. All of the males are yellow with black stripes. 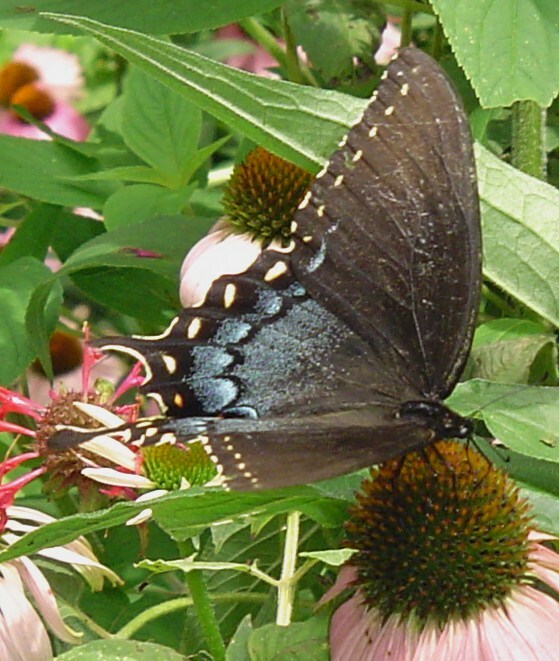 The dark form of the female Eastern Tiger Swallowtail butterfly on Echinacea. 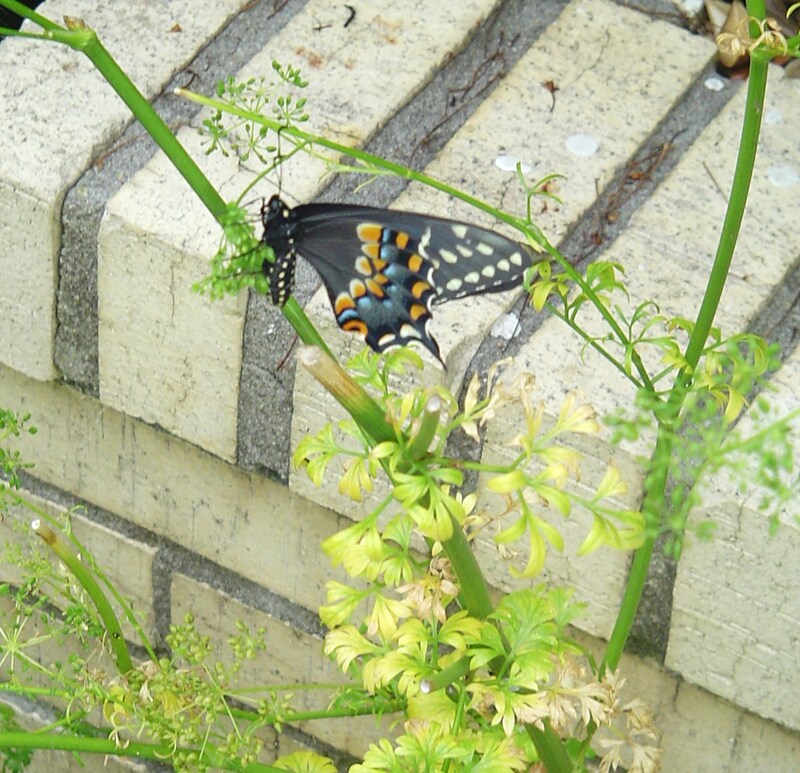 The female Eastern Tiger Swallowtail has blue on its wings. The male does not. The Painted Lady is about half the size of an Eastern Tiger Swallowtail. 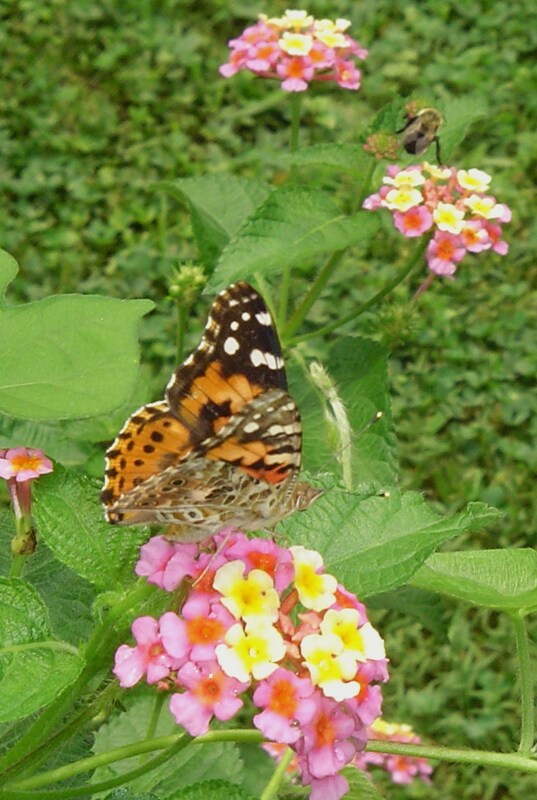 Here, feeding on Lantana. 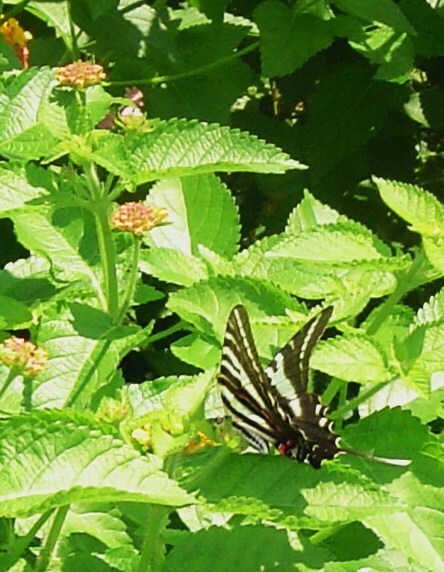 The female Eastern Tiger Swallowtail lays eggs a single egg on each host leaf. The caterpillars hatch and feed on hosts such as the tulip tree, willow, wild cherry, and cottonwood. The chrysalyd overwinters and hatches as a butterfly in early summer. Painted lady on Monarda, bee balm. 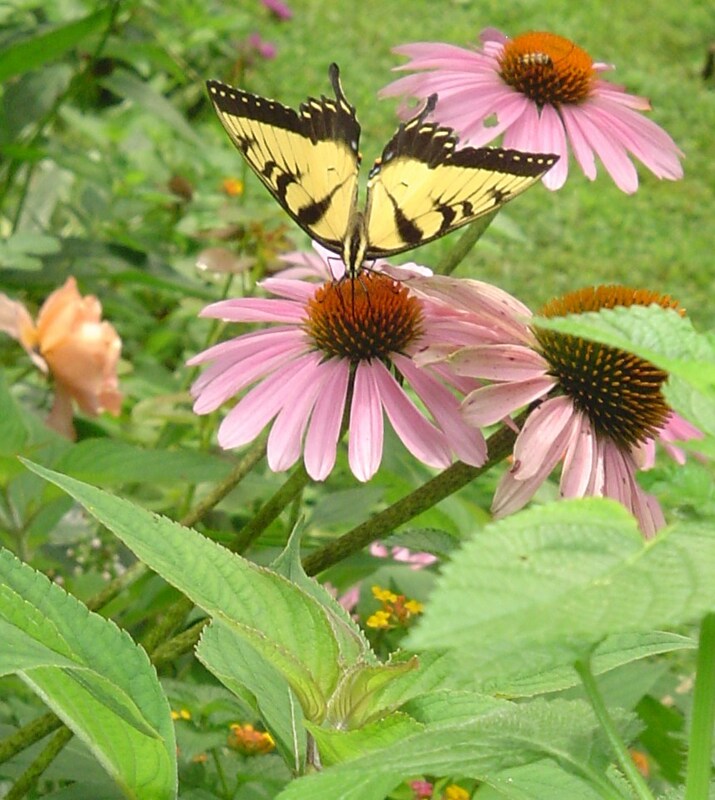 A female Eastern Tiger Swallowtail on Echinacea. The blue on the back of the wings sets it apart from the male. 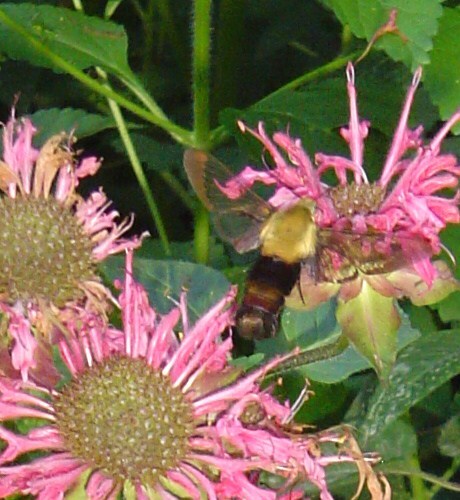 A hummingbird moth (Hemaris diffinis) and a bumblebee share a Monarda blossom. Close up of the hummingbird moth’s face. 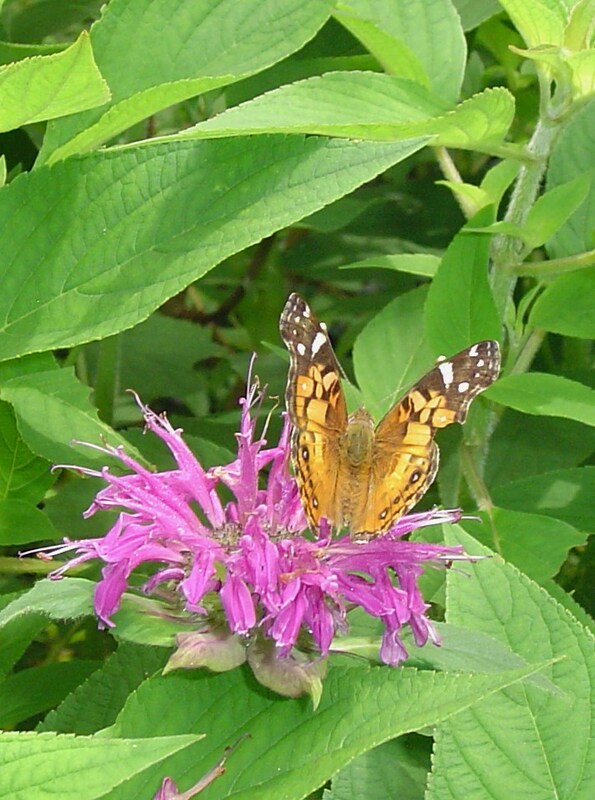 Hummingbird moth, which only eats nectar as an adult, feeding on Monarda. 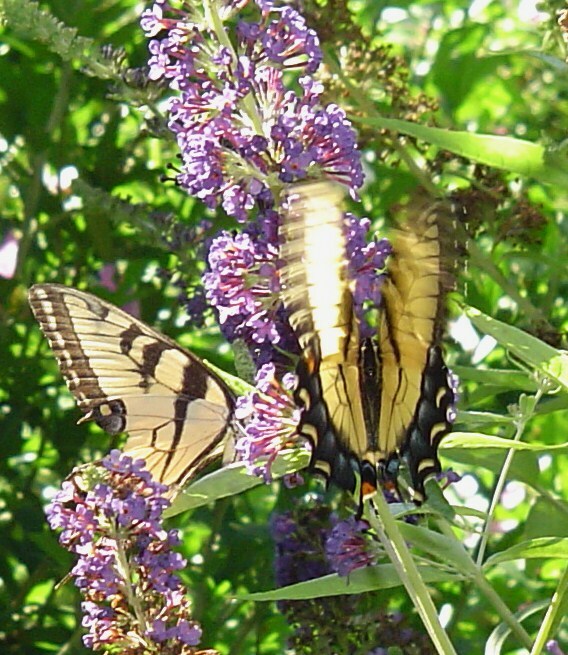 Male Eastern Tiger Swallowtail, with a torn wing, on Buddleia, Butterfly bush. Female, with blue on her wing. This appears to be a male/female pair feeding together. 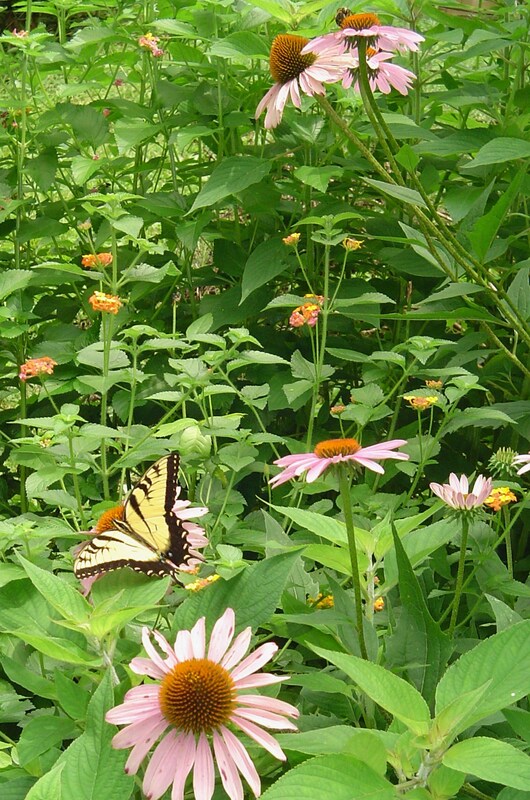 Butterflies and hummingbird moths need trees and shrubs for shelter. 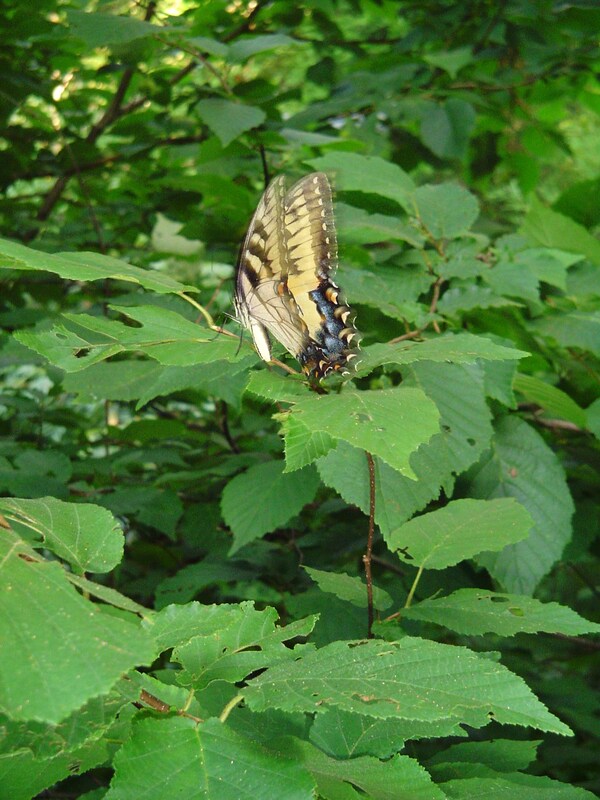 Most lay their eggs on the upper sides of the leaves of common shade trees. Although the caterpillars enjoy dill, parsley, Milkweed, Joe Pye Weed, and Butterfly Weed, they most often feed on the leaves of trees. In most cases, the tree isn’t damaged. (Bag worms, which grow into moths, are a different case entirely. They grow into moths found at night.) 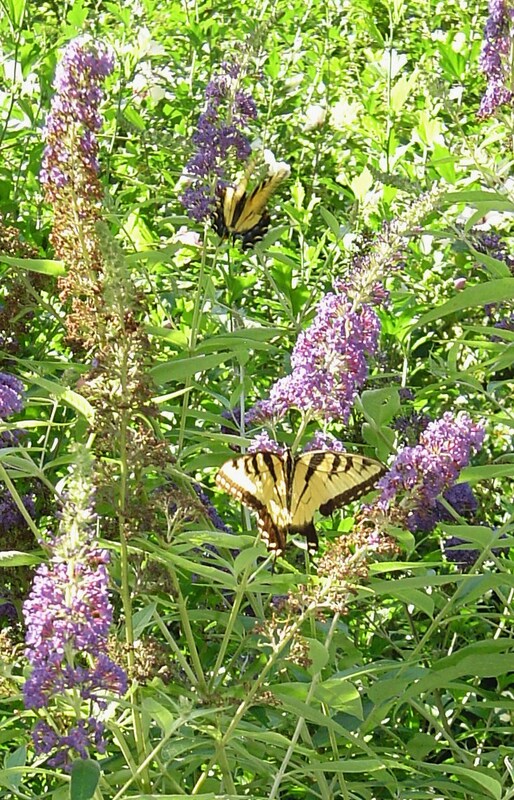 Adult butterflies and hummingbird moths prefer to spend their days in open sunny areas where they can fly freely and feed on nectar. Butterflies will rest and sun themselves on warm rocks and on wet spots on the ground. They are able to drink from muddy areas and areas of wet gravel. 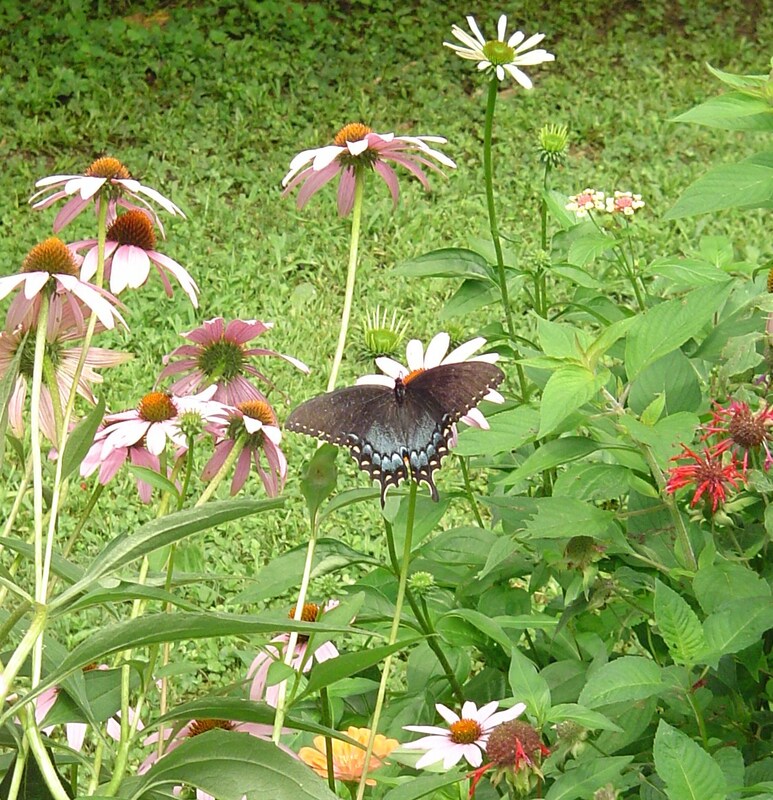 It is good to set a shallow dish of wet sand and gravel near a butterfly garden so there is a constant supply of water.